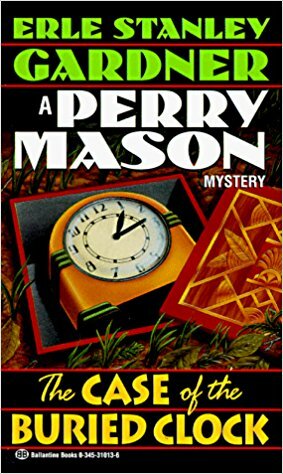 The latest Perry Mason novel I read (Erle Stanley Gardner. The Case of the Buried Clock. New York: Ballantine Books, 1943) has more overt references to World War II than the previous one (The Case of the Careless Kitten). “War time” was referenced, where clocks were pushed forward an hour ahead to save electricity. An explanation of the expression is found here. Astronomy is the place where Mason gets stuck for a good portion of the book and Paul’s comment helps him solve the case. This book got me thinking about the authorial voice. Early on I noticed that Gardner had certain sentence structures that he used again and again. I’ve never been so aware of an author’s writing style, especially sentence structure. There were a few formulations in this book that leapt out at me as I read. 1. The first I’ll call the “that … which/that” structure. 2. The second I’ll call the “with that” structure. 3. Ina number of these examples, a “which/that comes” formulation is used often (underlined above). None of this is meant as a complaint or critique so much as an observation. I’m just beginning to become aware of certain phrases that I use again and again. It’s hard to get around them and if you obsess on them, you might get stuck and never write another sentence. With first person, someone “in the story” describes the action as we experience everything through that person. Third person is different. Someone outside the world of the story tells the story. The Perry Mason mysteries are told in the third person. This gets a little tricky. In a first person story, the author may or may not be the narrator. If the story isn’t true, the person telling the story is likely not the author sharing their experience, but a person from the author’s imagination (allowing for unavoidable autobiographical elements). A story told in the third person doesn’t necessarily mean that the author is that storyteller either. Some years ago I read James Michener’s Hawaii. It’s a phenomenal book. If I recall correctly, it is written in third person from the beginning, but then at some point the authorial voice shifts for a moment. I don’t want to give anything way, but in a key moment the third-person telling gives way to a first-person comment. And so the rest of the book has two layers. There is the story that Michener is telling—and we wonder, as with all good stories, what will happen next and how will it end—and then there is this mystery of who is doing the telling. It doesn’t seem like Michener is the one telling the story (though, obviously, he wrote the book). Who does this voice belong to? It’s a great thing. I just finished listening to a book, The Noticer: Sometimes, all a person needs is a little perspective, by Andy Andrews (Nashville, Tennessee: Thomas Nelson, 2009). I enjoy Mr. Andrews, so this isn’t meant as a critique of what he is teaching (this is an engaging and worthwhile narrative about, as the title says, the importance of perspective), but I found it a little odd that his book began in the first person and then shifted to the third person and by the end was back to the first person. I don’t recall noticing the abrupt shift in point of view when I read the book some months ago, but as I listened to it this past week, that shift in voice didn’t work that well, perhaps because the entire book was read by the author. What if the first person elements were read aloud by Mr. Andrews and then the third person were read by someone else? Probably would have been even more distracting. Suddenly, with the last two lines, it appears we are going beyond observation. “Her attitude …” could be a description of how her affect might be perceived. But the last line, “She only wanted to get it over as soon as possible,” seems to be telling us what’s going on inside the character. This is something I will pay attention to in future novels. Are there limits for the omniscient third person narrator? Do those limits change? I do like the authorial voice to be consistent. When I’m thinking too much about that voice, whether it’s because of a repetitive sentence structure or a major shift in storytelling perspective, it’s a little distracting. I want that voice to be trustworthy. I want to know that I may rely on that voice to be telling me the truth, at least the truth as they see it. I’m sure there are some novels that play with this, where the narrative voice (either first or third person) has some issues with reliability, which becomes part of the experience of reading the novel. That gets confusing for me. I have enough trouble tracking characters and timelines and details, particularly with mysteries, without wondering if I need to be focused on the narrator as well. Not delightful. Pained, really. The genius of this novel is that Ishiguro has, unforgettably, captured the voice of a butler. You can have whiter teeth and fresher breath. You can take control of your life if you will follow these nine steps. My experience with stories, though, has them in first or third person.